It's easy to forget the Ford Fusion Energi exists -- but they're out there, and they're cheap. There's a lot of variety in used Fords today. A decade ago, the 2014 Ford Fusion wouldn't have been possible. Back then, Ford's European division got all the good stuff, and we Americans were generally stuck with the leftovers. But there's been a quiet revolution within Ford in the years since, and the 2014 Fusion is a case in point. Sharing most of its parts with the decorated Euro-market Mondeo, the Fusion is an all-out assault on the midsize sedan segment. It's Ford's honest best shot at taking down Camry and Accord, and we won't be surprised if the Fusion does just that. Naturally, we've found some nits to pick, but the real story here is the Fusion's emergence as a no-excuses contender. From the peppy, fuel-efficient turbocharged models to the incredibly fuel-efficient Hybrid, the Fusion lineup is packed with star performers. Giving your best is never a bad idea, and we suspect Ford will be reaping the benefits once Americans get familiar with this world-class Fusion. A frugal 1.5-liter 4-cylinder turbo engine debuts, and all Fusions can be equipped with inflatable rear seat belts. Also, the Hybrid is newly available in the more affordable S trim level. 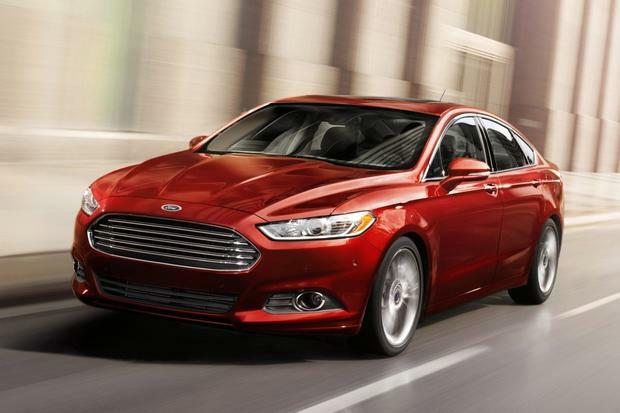 Standard on the Fusion S and SE is a 2.5-liter inline 4-cylinder rated at 175 horsepower and 175 lb-ft of torque. The only transmission is a 6-speed automatic, and fuel economy is estimated at 22 miles per gallon city/34 mpg hwy. A 1.6-liter turbocharged inline 4-cylinder packing 178 hp and 184 lb-ft is optional on the SE. A 6-speed manual is the only transmission offered with the 1.6, and it returns fuel economy of 25 mpg city/37 mpg hwy. If you order an SE turbo with the 6-speed automatic, you'll end up with the new-for-2014 1.5-liter turbocharged inline 4-cylinder, which offers about the same output as the 1.6-liter as well as an auto stop/start feature that helps deliver fuel economy of 23 mpg city/36 mpg hwy. Note that the 1.5-liter turbo may replace the 1.6-liter turbo altogether by the end of the 2014 model year. As for the Fusion Hybrid, it derives 141 hp and 129 lb-ft from its gasoline engine, while the electric motor adds 117 lb-ft of on-demand torque. The Hybrid's transmission is a continuously variable automatic (CVT). Fuel economy is superb: Expect 47 mpg city/47 mpg hwy, which blows away the competition. 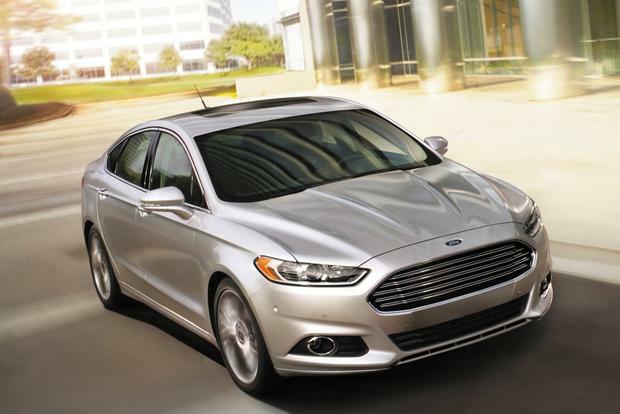 The Fusion is offered in five trim levels -- S, S Hybrid, SE, SE Hybrid and Titanium. The S ($22,695) kicks things off with 16-inch steel wheels, automatic halogen headlights, LED taillights, full power accessories, air conditioning, cruise control, a tilt-telescopic steering wheel with auxiliary controls, intermittent wipers, a height-adjustable manual driver seat, a trip computer, MyKey parental control capability, Sync voice-command functionality with MyFord mobile-app support and a 4-speaker audio system with an auxiliary input jack. The SE ($24,650) steps up to 17-in alloy wheels, SecuriCode keypad access, a 10-way power driver seat with adjustable lumbar support, satellite radio, six audio speakers instead of four and eligibility for a variety of options that the base S doesn't get, including the smaller turbocharged engines and a navigation system that upgrades the default central display to a large, colorful touchscreen. The S Hybrid ($26,995) gets 17-in alloy wheels, dual-zone automatic climate control and the Hybrid-only SmartGauge instrument cluster, and it also trades the regular car's compact spare tire for a less space-consuming mobile repair kit. Otherwise, it's equipped similarly to the nonhybrid S trim. The SE Hybrid ($27,995) enjoys the S Hybrid's special add-ons and is otherwise equipped similarly to the nonhybrid SE. The Titanium ($31,295) turns on the charm with a powerful 2.0-liter turbo engine, 18-in wheels (a few different 19-in designs are available), fog lights, dual exhaust tips, keyless entry with push-button ignition, dual-zone automatic climate control, leather upholstery, heated front seats with 4-way power passenger adjustments, rear parking sensors, a rearview camera, a leather-wrapped steering wheel with paddle shifters, an auto-dimming rearview mirror, aluminum pedals and an exclusive 12-speaker Sony audio system with MyFord Touch. The Titanium Hybrid ($33,295) essentially pairs the Hybrid's exclusive hardware and technology with the regular Titanium model's standard features. Options on lower trim levels include various items that come standard on higher trims. Also available are such niceties as a navigation system, adaptive cruise control, an automated self-parking system and a sunroof. In terms of versatility, the regular Fusion's trunk boasts 16 cu ft of capacity, which is on the large side for this class. Unfortunately, the Hybrid's hauling ability is hampered by its crudely integrated battery pack, which sticks out of the trunk floor like the front stoop of a house. For a hybrid, though, the Fusion Hybrid is pretty capacious, checking in at 12 cu ft. The 2013 Fusion comes standard with 4-wheel anti-lock disc brakes and eight airbags (front, front side, front knee, full-length side curtain). Crash-mitigating inflatable rear seat belts are optional on all trims. Numerous electronic driving aids are also offered, including a blind spot warning system, lane-departure assist to keep you pointed straight, adaptive cruise control and a "cross-traffic" warning system for when you're backing out of a tight spot. In government crash testing, the Fusion received a perfect five stars out of five overall, including five stars for front impacts and four stars for side impacts. 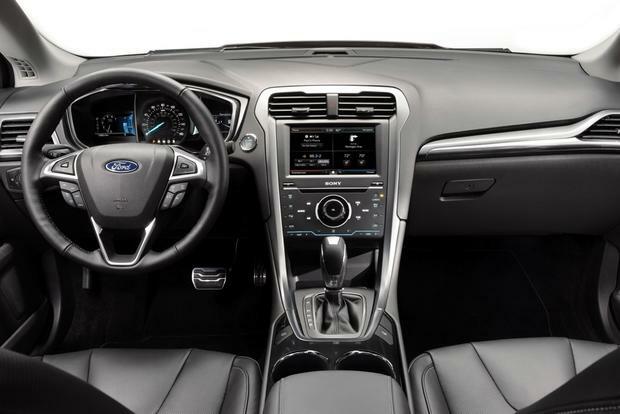 In our interior evaluation, we were immediately struck by how modern the Fusion's dashboard and controls have become. The cabin seems thoroughly up-to-date, from the crisp gauges and standard steering-wheel-mounted controls to the rakish driver-ward sweep of the center stack. We also appreciated the snug front seats, though those accustomed to generous American seat dimensions might not. Rear passengers should enjoy their time in the Fusion. Maximizing space beneath the fastback rear roof line was clearly a priority, as even 6-footers have headroom to spare. Legroom, too, is plentiful, if not quite as limo-like as the generous wheelbase would suggest. 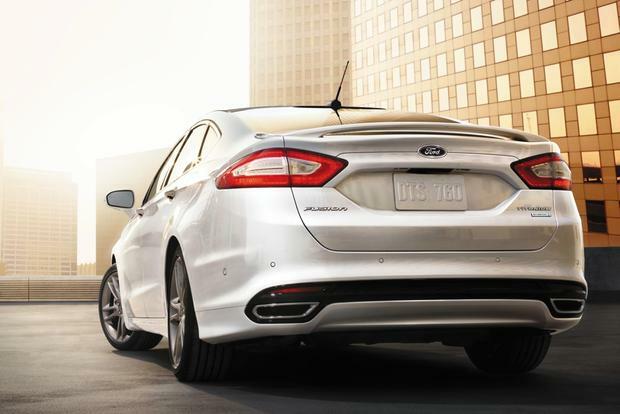 On the road, the Fusion impresses with its athletic demeanor, shrinking around you at speed like a sport sedan. 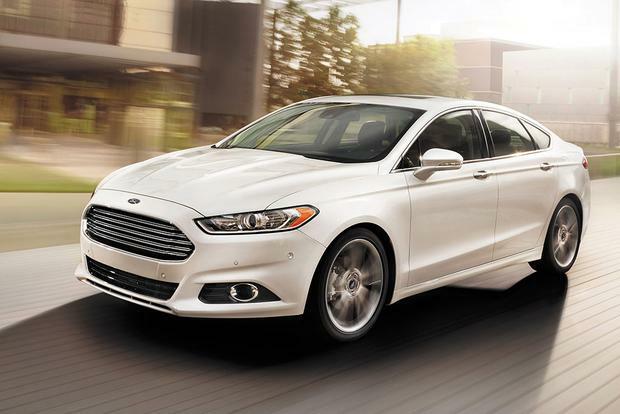 Around town, the trade off for that athletic poise is evident in the Fusion's firm ride. While we think there's a great balance here between sport and comfort, it's definitely weighted toward the European end of the spectrum. One aspect that's top-notch by any regional definition is noise suppression, which approaches luxury grade. Under the hood, the base 2.5-liter 4-cylinder is a serviceable workhorse, but it's a carryover from the previous-generation Fusion, so you're not getting the latest and greatest. The two pint-sized turbo engines (1.6-liter and 1.5-liter) are more in tune with the times, delivering both satisfying fuel economy and decent punch. The Titanium's 2.0-liter turbo is saucier, no doubt, but the Titanium also packs some extra pounds, so the difference is more like going from mild to medium salsa, especially with the weighty all-wheel-drive system aboard. As for the Fusion Hybrid, it feels quite responsive underfoot thanks to the always-on torque of its electric motor, and the surprisingly attentive CVT is happy to follow orders. The Hybrid's gas engine is noisy, though, as if it's grumbling at you for having woken it up. Kia Optima -- The Optima is a compelling Fusion alternative, offering striking styling of its own along with a stronger 2.0-liter turbo and an available Hybrid variant. Toyota Camry -- The Camry Hybrid is the Fusion Hybrid's closest competitor, and we wouldn't buy one before trying the other. Volkswagen Passat -- The Passat's sense of style is far more conservative, but VW's midsizer stacks up well against the Ford. Check out the diesel-powered TDI as a dark-horse Fusion Hybrid alternative. Our pick would be an SE with the turbo motor and touchscreen interface. It's a satisfying combination that won't break the bank.